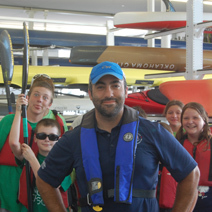 Coach Aasim (pronounced "awesome") with some area kids in one of his many paddling classes with the OKC RIVERSPORT. Coach Aasim lending a hand to his students as they carry their kayaks to the river. Kids participating in the summer camp are keeping cool on a hot summer day while having fun with their camp leaders. Coach Aasim instructing a kayaking student on how to adjust the seat of the kayak. “Yes!” Along with a shy smile, that was the answer a little girl gave her mom after being asked if she enjoyed her first time paddling and wanted to take more lessons. Around her, about seven other kids also clamber up from the river dock, carrying their boats with the help of an instructor. All of them appear happy, sufficiently pleased with their day’s paddling, and, with the exception of one unfortunate boy, fairly dry. Though, to be honest, this boy actually appears the most pleased of anyone. These are just a few of the kids that the Boathouse Foundation has attracted in the past year through their camps and youth league, lead by Aasim Saleh, program director and head coach of the Youth Canoe/Kayak League. His passion for the sport is evident as is his eagerness to instill that same level of passion in others. Throughout the year, Saleh travels to schools around the Oklahoma City area and teaches free physical education classes. With him, he brings kayak machines to engage students and spark their interest in the sport. This past year was his first recruiting season, which brought a 1000 percent increase in enrollment. Perhaps the best aspects of paddling in Oklahoma City are that it is easily accessible and has no optimal body shape or size. Paddling is basically the best friend of sports—always there when you need it and never judging you, no matter how much ice cream you may or may not have just consumed. Because all the boats are adjustable and relative to the paddler’s size, paddling is an all figure-friendly sport. “You buy a kayak like a shoe size. Everything is extremely relative,” Saleh points out, illustrating his point by mentioning that one of the top athletes in their Olympic training program measures about 5’4” while another towers over six feet. The boathouse also supplies kayaks designed to make paddling accessible and enjoyable for those with physical disabilities. “We run practice 365 days a year. We’re one of the few sports that never cancels practice,” says Saleh also adding that on days when the outside conditions do not allow for paddling, the boathouse offers alternative training and conditioning methods, such as weight lifting. One-week camps in the summer are available in half and full day options. Also offered is the youth league, which has fall, summer, and spring seasons. Kids learn directly from pro-athletes, providing both gold-medal knowledge and experience to the kids, and employment for the athletes, many of who have relocated from other parts of the country or world to train at the foundation. “All these things that are coming are making us the coolest thing in Oklahoma for kids. Once the kids decide this is what they want to do, we have an endless supply of cool factor and role models,” Saleh remarks. Basically, paddling is the best friend you will ever have who also happens to be a cool jock. Bonus. Summer Camps are available for youths between the ages of 8 and 17. There are no tryouts or cuts for the canoe/kayak league. Because the Oklahoma River the only river in the nation to be designated a U.S. Olympic and Paralympic training site, many athletes have relocated from other parts of the country and the world for the opportunity to train in Oklahoma City. The OKC National High Performance Center is sending six athletes to the U.S. Olympic team and two to the U.S. Paralympic team. The Boathouse District is growing, continuing to offer more opportunities for active adventure. Soon they will have a youth pavilion with indoor surfing; the world’s tallest Sky Trail ropes course; a whitewater center and more, which will let them give youth and families even more opportunities to get active. To learn more about OKC RIVERSPORT canoe/kayak programs for youth and adults visit riversportokc.org, call (405) 552-4040 or email info@riversportokc.org.